There was both good news and bad news in the Social Security trustees' report released last week. The bad news is that the program is projected to cost somewhat more in the latest report than in the 2010 report. As a result, its projected 75-year shortfall was increased by 0.3 percentage points of covered payroll from 1.92 percent to 2.22 percent. The year when it was first projected to face a shortfall was moved up a year from 2037 to 2036. This bad news about the program is also the good news. The main reason that the program's finances deteriorated between the 2010 report and the 2011 report is that, in the 2011 report, the trustees assumed that we would enjoy substantially longer life expectancies than they did in the 2010 report. They increased their projected life expectancy for men turning age 65 in 2010 from 18.1 years to 18.6 years, a gain of 0.5 years. The trustees increased their projected life expectancy for women turning age 65 by 0.3 years. Remarkably, virtually no one in the deficit-obsessed media even noticed this projected increase in life expectancy, simply highlighting the bad news about Social Security's finances. Of course, the trustees likely anticipated how their report would be received. It is important to recognize that this is the report of the Social Security trustees, not the professional staff of the Social Security Administration (SSA). The six trustees include three Obama cabinet members, the head of the SSA, who is a holdover Bush appointee and Charles Blahous, an independent trustee who was President Bush's point man on his Social Security privatization drive. The professional staff of SSA does make recommendations to the trustees, but these recommendations are held as carefully guarded secrets, like battle plans in the war on terrorism. It would be interesting to see these recommendations since it is not obvious why the trustees are now so much more optimistic about life expectancy than they were last year. It is worth noting that their optimism does not extend to future gains in life expectancy. The 2011 report actually projects less improvement in life expectancy over the next 70 years than did the 2010 report. Even accepting the 2011 report at face value, the picture is hardly as dire as many politicians in Washington are claiming. We have seen much worse before. For example in 1997, the trustees projected a shortfall that was equal to 2.23 percent of payroll. At that time, their projections showed the trust fund first being depleted in 2029. The 1997 report also assumed a slower rate of real wage growth than the 2011 report. A lower rate of real wage growth meant that any tax increase that might have been imposed to maintain long-term solvency would have taken up a larger share of the growth in the real wage of the average worker. Alternatively, any cut in benefits would have done more to slow the improvement in the living standards of retirees over time. There can be little doubt that the most recent projections show a much brighter picture of Social Security and the economy going forward than what was projected through most of the 1990s. 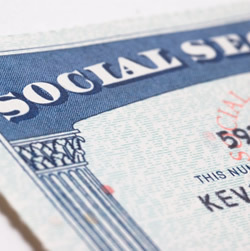 It is also important to keep the Social Security numbers in context. Proponents of cuts to Social Security have spent fortunes on pollsters and focus groups trying to put the program's finances in the most dire possible light. They are fond of reporting things like the program's $17.9 trillion shortfall over the infinite horizon. The focus groups show that this one is really good for scaring people. After all "trillion" is a really huge number and $17.9 trillion must be really, really huge. Of course no one has any clue what "infinite horizon" means. So, no one knows that this is a projection of what the program looks like in the 23rd, 24th, and 25th century and beyond, if we never change it in any way. The vast majority of this $17.9 trillion shortfall comes in years after 2200. Social Security does have a long planning period, but if anyone thinks that we are actually making policy for the 24th century then we should keep this person far removed from the levers of power. The best way to make the size of the projected Social Security shortfall understandable is to put it in context. Relative to the size of the economy, the projected Social Security shortfall is equal to 0.7 percent of GDP. By comparison, annual spending on the military increased by more than 1.6 percentage points of GDP between 2000 and 2011. So, the burden imposed by the wars in Iraq and Afghanistan is almost 2.5 times larger than the money that would be needed to eliminate the Social Security shortfall. To take another point of reference, the Congressional Budget Office's analysis of the Ryan Medicare privatization plan implied that it would increase the cost of buying Medicare equivalent policies by more than $34 trillion, a sum that is almost five times as large as the projected Social Security shortfall. If the Social Security shortfall is a really big deal, then the additional costs attributable to the Ryan plan are five times a really big deal. Interestingly, almost no one in the media seems to be talking about that burden.